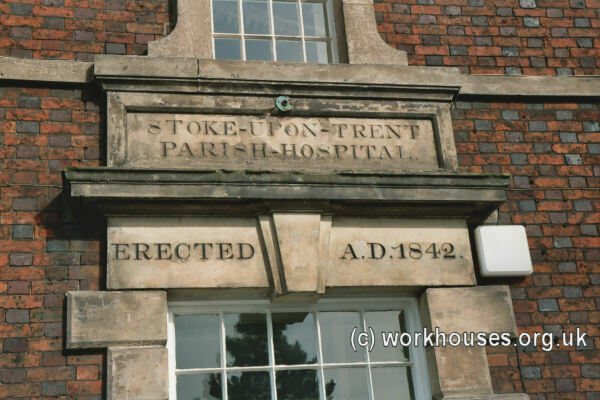 The first workhouse in Stoke-upon-Trent (now known as Stoke-on-Trent) was set up in around 1735 at the southern end of Penkhull village at the junction of Penkhull Green and what is now Trent Valley Road. It was a large three-storey building with an L-shaped layout. 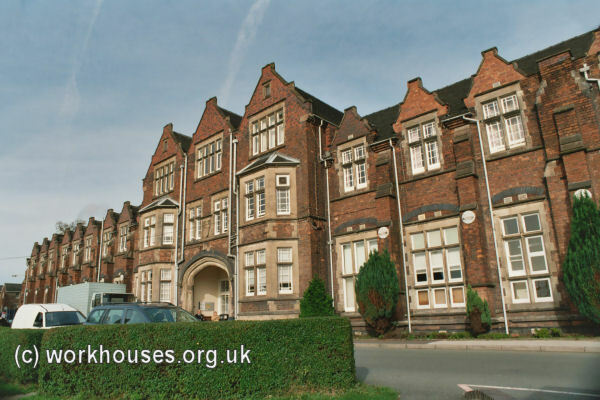 A Parliamentary report of 1776 recorded the Stoke-upon-Trent workhouse as having accommodation for up to 80 inmates. Its inmates were 'farmed' by a contractor at a cost of around £1,000 per year in the 1770s and 1780s. A new building was erected in 1832 on London Road and the old building sold off — it was converted into three houses and later became known as Victoria Buildings which survived until 1967. According to a report in 1836 by Assistant Poor Law Commissioner Richard Hall, Stoke "was managed by a Select Vestry under Sturges Bourne's Act, and is provided with a workhouse, constructed on the plan of Mr Becher, of Southwell, for the accommodation of 500 inmates, duly classified." However, Hall also found a catalogue of malpractice in existing poor law administration which was mainly in the hands of men who were also local manufacturers. For example, threats of industrial action from an already substantially unionized workforce had led to the provision of out-relief being extended (contrary to official regulations) to those in dispute with their employers, rather than just those who were unable to work. Because of its large population, the parish of Stoke-upon-Trent did not need to form a Poor Law Union with other parishes in the area following the 1834 Poor Law Amendment Act. The Stoke-upon-Trent Poor Law Parish was formed on 30th April 1836, governed by an elected Board of 24 Guardians. The Parish had had a population of 37,220 in the 1831 census, and a poor-relief expenditure of £11,550 for the period 1833-5. The existing parish workhouse was taken over by the new administration. The following account of the workhouse's history (illustrated with modern photographs) is from an Almanac of 1902, at which time plans for a major enlargement were being debated. As the question of greatly-enlarging the Workhouse, at a cost of £27,000, has filled the public mind for the last few months, we think it not out of place to offer the following interesting particulars of the establishment and development of this essential Institution. 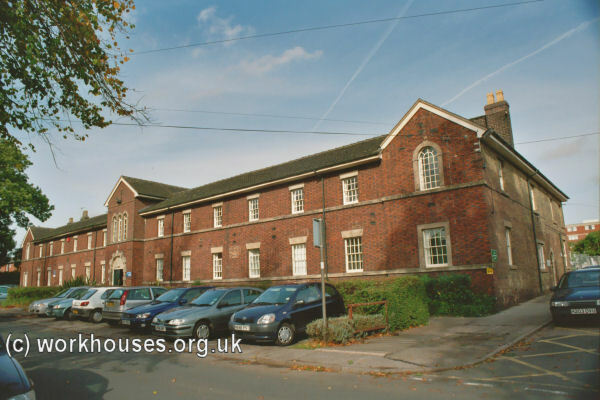 In our article we shall not go into the history of the first Workhouse, which was erected at Penkhull early in the eighteenth century, the building still standing, converted into dwelling houses. This must be left for some future article, as space will only permit of the records of the present edifice. The first step taken, when it was found that the old place was no longer suitable, was in 1832, when the building, now known as the "House" was erected. It was planned to accommodate about 270 inmates, and consisted of one large block; one wing being for men, and another for women, the two departments being separated by Master's and Officers' quarters, and the dining hall. In front of this main building were two smaller ones devoted to the use of boys on one side, and girls on the other. At the back were two ranges of buildings, the first one fitted up for old men, the bakehouse, and the nursery; and the second (an old factory that had been purchased as it stood, with the land) which was used as stables, laundry, workshops, and coal store. Down the west side of the buildings was another department, containing the well, cells, female receiving ward, female tramps, bath, male tramps, male receiving, ward, and lodge. Stoke 1842 school house from the south, 2001. This was arranged to hold about 80 patients, and was found a very valuable addition to the Workhouse. Stoke 1842 Parish Hospital from the west, 2001. A few years afterwards it was found that a School was very necessary, as the number of child inmates had grown considerably; so in 1866 a School, capable of accommodating about 250 scholars, was opened and used until some three or four years ago, when the Guardians decided that the youngsters should attend the Board Schools. The School Board receive 6d. per week for each child, this sum being paid by the County Council. The School was of course used for the living rooms, &c., by the children up to the time of the opening of the new Cottage Homes when all juniors over the age of three years were transferred there. Stoke 1866 school block from the south, 2001. About 1870 more additions were made to the Hospital Branch, when the "New Hospital" (now known as the Infirmary) was opened. This had a holding capacity of 145 persons, together with the necessary staff of nurses, &c. These arrangements sufficed for about 14 more years, up to 1884, when a hospital for female inmates and one for males was added, together with a large building between the two departments used for kitchen and laundry purposes. These new wards can comfortably house 165 sick, and by their addition the Master was able to classify his cases. The "New Hospital" was then named the Infirmary, and all chronic cases were dealt with there, and in the new hospitals were placed the acute cases. This arrangement is the same to-day, and the first Hospital (1842) has been altered to accommodate, in a very crowded manner, 130 old men. (It is really only large enough for 80). The old "House" will eventually be fitted up for children and women, when the proposed new additions have been carried out. Up to 1894 the mild cases of lunacy were treated in the old portion of the house, but at that date two new detached blocks were built, one for male lunacy and the other for female lunacy cases. These two departments will hold 140 cases, very bad ones being removed to Cheddleton. Stoke 1894 male lunacy wards from the west, 2001. Now to deal with this very large sick and lunacy department, there is a staff of one resident Medical Officer (Dr. Adkins), and , one Visiting Doctor (Dr. Hind), together with the small number of sixteen nurses, the latter having to live in their various wards. However, the Guardians have wisely come to the conclusion that this staff is inadequate, and moreover, that it is not good for the health of the nurses that they should be entirely with the sick; so a large Nurses' Home is now being erected which will give comfortable and cheerful room to 30 Nurses. The next addition came in 1899, when a new lodge (with residence for those in charge of the casuals), receiving wards for prospective inmates, vagrant wards, and, at some distance from the main blocks of buildings, stables and piggeries. When a person desires to enter the workhouse as an inmate, (not casual), having received his (or her) proper form of admission, he is taken first of all to the new receiving ward. Here his clothing is taken away, thoroughly disinfected, and stowed away in case they may be required again. Then he is taken to an excellent, warm and comfortable bathroom, where a hot bath is given, after which a night-gown is supplied and the applicant is shown to a good bed, in a room where about twelve can be accommodated, First thing in the morning he is examined by the doctor, and on that gentleman's certificate is placed in whatever department he is fitted for. He is now on probation, and at the next following meeting of the Guardians his case is gone into; and if found deserving, he is allowed to stay in the house; if not, the alternative course is taken. The method of dealing with casuals is different. A tramp has first to obtain a ticket of admission from the Police Office, he then makes his way up to the Workhouse, and at six o'clock gains admission. Off come his clothes. an attendant takes them to the stove for disinfection, and the casual takes quite a luxurious bath. This bathroom is warmed by steam pipes, is commodious, well lighted, and scrupulously clean; the bath being fitted with hot and cold water. On emerging from the water, he receives a clean nightshirt, three quilts and a straw pillow. He is then taken back to his sleeping cell, which is lighted by gas (with the governing tap outside), and has an electric bell which he can ring if anything important is required, for he is locked in; there he finds a wire mattress fixed to the wall, on which he fixes his bed-clothing and so to sleep. Stoke 1899 vagrants' blocks from the south, 2001. 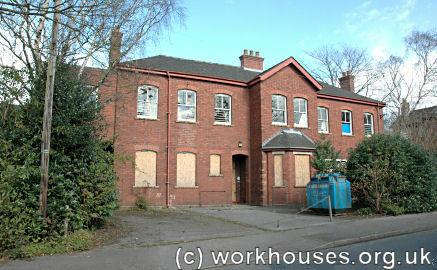 Stoke Workhouse is not overcrowded with casuals, luckily, for they evidently think the task allotted them is too much. When they wake in the morning they receive 6 oz. of bread and 1 pint or gruel, or 8 oz. of bread, with water, (for supper, the previous night, 8 oz. of dry bread, with water has been served) then they are transferred into a cell at the back of the one they have slept in, and here is found 10 cwt. of stone, which the tramp has to break into pieces, small enough to go through a grating in the window, during the day. If this occupation is considered unsuitable, they may pick 3 lbs. of oakum instead. For dinner, 6 oz. of bread and 1½ oz. of cheese is allowed, and supper is the same they received on the first night. They sleep two nights in the casual ward, and are then turned out after breakfast to probably walk on to Stone Workhouse, if that is the direction in which they are tramping. The oakum is sold principally to boatmen for caulking purposes. Under the old system the tramp had only to sleep in one night, and first thing in the morning break 3 cwt. of stone, getting away soon after nine o'clock. To shew the difference the new system has made, we may point out that during the twelve months ending March 25th, 1900, 15,320 casuals were dealt with on the old lines, and during the following year ending March 25th, 1901, the number had been reduced to 1,680, by the new arrangements. With the women casuals the tasks are somewhat different. They may pick 2 lbs. of oakum, or some other work is found for them. Often enough, when the tramps are turned out, if they have been well behaved and done their best, some little addition is made to their wardrobe by the kindly attendant. It may be a hat or cap, or a shirt, or perhaps a new pair of very necessary braces for the little boy. Our opinion is that the casual fares very well at the Stoke Workhouse. and the task set him is certainly not too great a payment for the food and accommodation he receives. Of course the amount of work demanded will vary according to the particular case. If a tramp is palpably unable to accomplish the task, it is reduced; and good behaviour will sometimes lighten the work. The tramp that gives unnecessary trouble need not look for sympathy, for none he deserves. As the children have now been transferred to the Cottage Homes, the school block is to be altered to make living accommodation for all old men over the age of 60 years, and at the back a new building will be erected to accommodate 144 men under the age of 60. As before stated, the first workhouse was built for 270 inmates, but these periodic additions have brought up the holding capacity to over 1000 (the number at present in the House,) Of this number, 426 are veterans over the age of 60, who are quite unable to perform any work commensurate with the benefits they receive. All the rest of the inmates, excepting the sick, have work allotted to them each day and, speaking generally, they get through their duties in a happy and contented manner. Four meals are served each day from a fixed Dietary adopted by the Guardians and sanctioned by the Local Government Board. Breakfast is served at 7 o'clock, lunch 10 to 11, dinner 12 to 1, supper at 6 o'clock. No intoxicating drinks are allowed excepting when specially advised by the Medical Officer. The old men, by the kindly consideration of the Guardians are given 1 oz. of tobacco each week, and in lieu of this; the old women get 2 oz. of tea and 8 oz. of sugar extra each week. The question of amusements is not overlooked, for nine concerts are given during the winter months. In addition to these, the Institution is provided with several different musical instruments, including a phonograph and gramaphone. Then there are games, such as dominoes and draughts, for those who care for them, and plenty of reading matter—in addition to that purchased by the Guardians—is sent in from time to time by the kindly-disposed residents of the district. No particular form of religion is forced upon the inmates. The Roman Catholics are allowed to attend the Newcastle Catholic Church. The Dissenters hold divine worship in the Workhouse Chapel, each Sunday morning, this Chapel being a separate edifice used entirely for religious services; and the members of the Church of England attend service in the Chapel each Sunday afternoon and Wednesday evenings. The Rev. J. Edwards is the paid Chaplain. 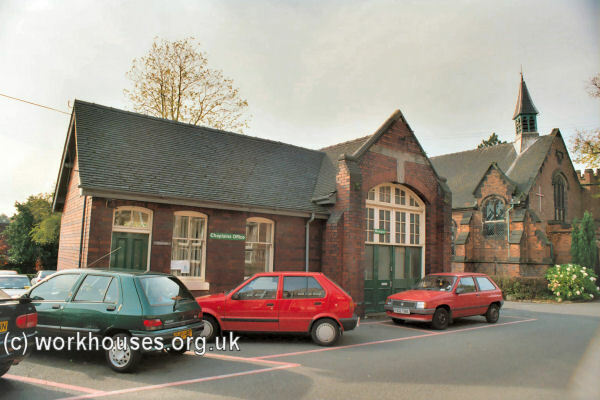 Stoke 1907 fire station (left) and 1866 chapel (right) from the east, 2001. 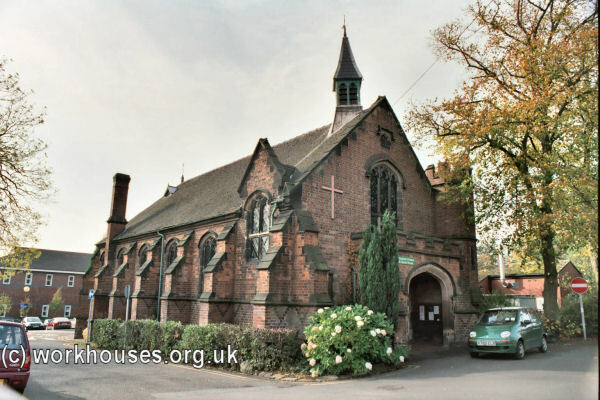 Stoke workhouse chapel (right) from the east, 2001. As may be expected very elaborate precautions are taken in case of fire. The Guardians have purchased an excellent supply of appliances which may be seen in every quarter, and Captain Coleman, of the Stoke Borough Fire Brigade, attends once a month to give instruction to the Male Officers' Fire Brigade, whilst the Nurses undergo monthly drills, An additional supply of water, on the high-pressure system, has been laid on for fire purposes alone. 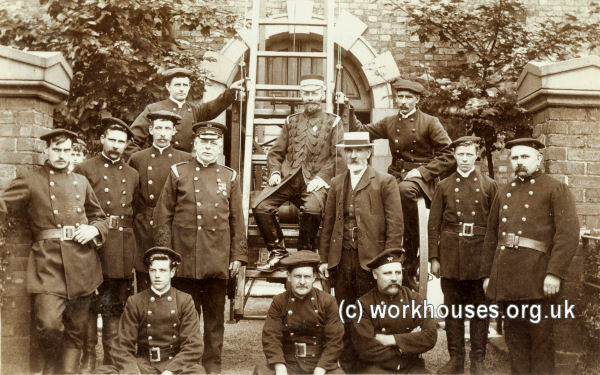 Stoke workhouse fire brigade, c.1906. We have seen the gradual, yet none the less regular, growth of the Workhouse. Additions have been constantly made to meet the increased demands, And yet even now the place is greatly overcrowded, and the rapidly-growing family must have more space. So cramped have they become that it is frequently found necessary to sleep five men in four beds, and three in two beds, a most objectionable method as one will readily admit. After many months of careful consideration and planning, it has at last been decided to make very extensive additions at a cost of £27,000, and anybody Who cares to look over the Workhouse, and thoughtfully considers the position of affairs, must very soon be convinced that its outlay, great as it may seem, is absolutely necessary. The present arrangements for stores, a most important department, are crude and out of date, and quite inadequate; it is totally impossible to stock any large quantities of goods, and therefore purchasing is done on a smaller scale, the terms obtainable by this method being less than could be expected if goods were bought, as they ought to be, in larger quantities. It has been decided to pull down the old Parish Hospital of 1842, which stands in the middle of the various buildings, and on this central site to erect a dining hall capable of seating 600, kitchen (the cooking arrangements at present are much too small) store rooms for meat, milk, vegetables, coal, &c.; bakehouse, female officers' mess-room, male officers' mess-room, large block for general stores, Master's house, together with offices and board-room. Those buildings will extend right up to the new laundry and electric light station, which have been built this year. Both the Workhouse and the Cottage Homes are lighted by electricity. When these great additions have been made, the old Workhouse will be used for housing all women, and young children up to the age of 8 years. To summarise, we may say that everything that is possible is done for the comfort, both spiritual and temporal, of the inmates; The food is of excellent quality, the living and sleeping rooms are cheerful, although crowded, and the kindly consideration shown by the staff to everyone is remarkable. Children over the age of one year have, of course, to be separated from their mothers, for a special staff has to deal with this department, but according to the rule of the house a mother is allowed to see her child once a week. This is the rule, yet with half-an-eye one can I readily see that this rule is not strictly enforced, and the mother may have many opportunities of seeing her offspring. Harsh treatment is a thing of the past, and the experiences of poor Oliver Twist could not occur in such a well-regulated, kindly and considerately-governed Institution as the Stoke Workhouse. Where punishment is deserved it is meted out, for the Master's hand must be as firm as is that of the Captain of a ship, and his word must be law. Those who have the pleasure of Mr. Roberts' acquaintance know him to be particularly well fitted for the office of Master, and in him the Guardians have a gentleman who thoroughly understands his duties, and can carry them out with that extreme tact that is so necessary in filling such a position. In the event, the proposals to demolish the 1842 Parish Hospital were not carried out, although several new blocks were erected to its rear including a new administration building, bakery, laundry, and wood-chopping room. The fire-station pictured above also dates from this phase construction phase. A corn-mill was added to the wood-chopping room in 1910, and in 1913 a new children's hospital (now demolished) was erected to the south east of the 1866 school block. The site layout is shown on the 1940 map below by which time the site had become known as Stoke Public Assistance Institution. Stoke-upon-Trent workhouse children's hospital, c.1916. In 1894, a reorganisation of boundaries divided Stoke into a number of separate new parishes. The Stoke Poor Law Parish was accordingly reconstituted as a Poor Law Union. In 1922, the Stoke and Wolstanton and Burslem Unions merged to create a new Stoke and Wolstanton Poor Law Union. 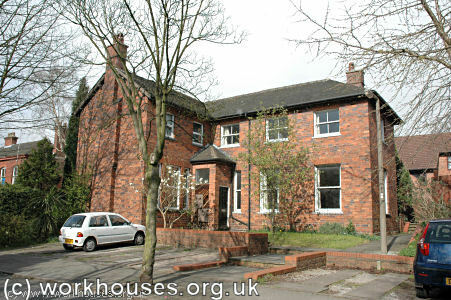 In around 1907, a new administration block was erected on the site of the 1832 workhouse main block. 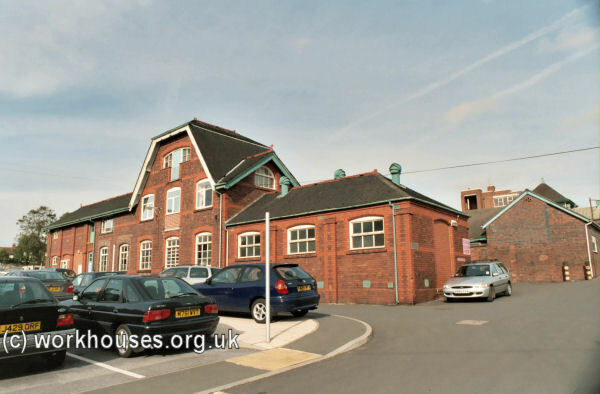 Stoke-upon-Trent workhouse new admin block, 2001. At the same period, the facilities for providing male inmates with labour were updated, with a new wood-chopping room and cornmill being installed between the new administration block and the 1866 school block. 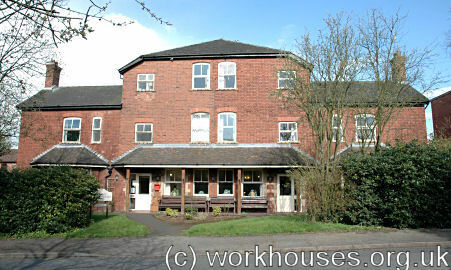 Stoke-upon-Trent workhouse wood-chopping and cornmill block, 2001. 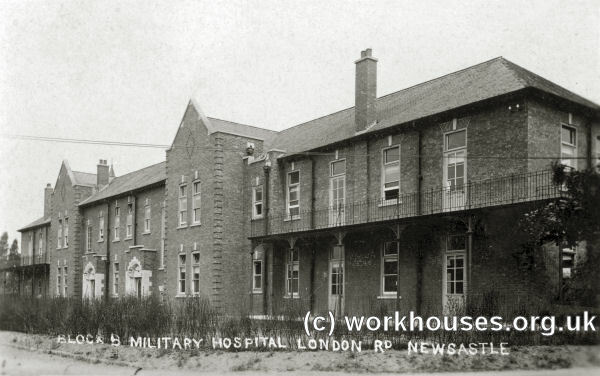 During the First World War, the site became a military hospital, providing 711 beds for 'other ranks'. In 1930, management of the establishment of the site was taken over by Stoke-on-Trent Corporation and it became formally known as a Public Assistance Institution. Following the formation of the National Health Service in 1948, the site became Stoke City General Hospital, now the Royal Stoke University Hospital. 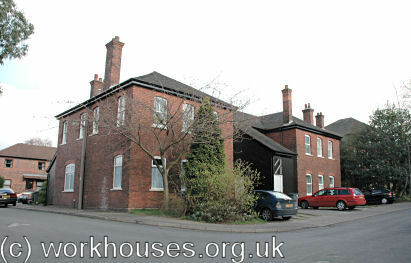 Many of the original workhouse buildings still stand. 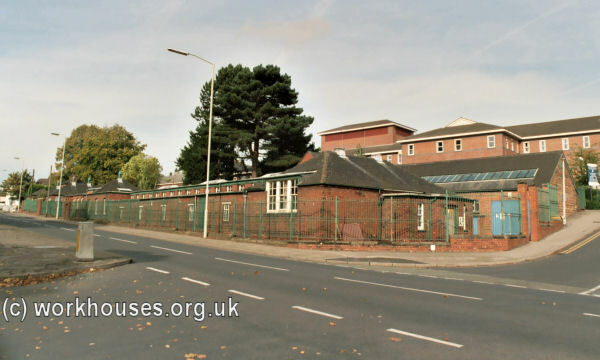 In 1900-01, the Stoke Guardians erected a children's cottage homes site at Penkhull. The land, adjacent to Grindley Hill Farm in Newcastle Lane, was purchased from Elizabeth Coombe for the sum of £1,008 11 6d. Construction of the buildings cost around £14,000. The cottage homes were formally opened on Friday, 19th December 1901, by the Right Hon. Henry Chaplin., M.P. The original development comprised twelve homes, a receiving block and a house for the Superintendent, Mr Till, whose wife was the homes' matron. Each home accommodated a 'family' of around dozen children under the care of a house 'mother'. By the time of their official opening the homes were already full with 140 children in residence aged from one upwards. A local press report on the opening recorded that "the children parade under the leadership of Superintendent Till, to meet the gathered company, the boys in blue cloth caps and neat dark suits which had nothing of the old workhouse garb's appearance. The girls wore spotless white pinafores, frocks of different colours and wearing tams of light blue and red wool. The children looked remarkably healthy and what is equally important, they looked decidedly happy. The snow on the ground showed them up well and the invigorating atmosphere gave their cheeks a decisively warm glow." Children's natural mothers were allowed one visit a week. The site was arranged in the form of a street with the children's homes along the west side and the communal and administrative buildings along the east. Penkhull Homes Superintendent's house, 2005. 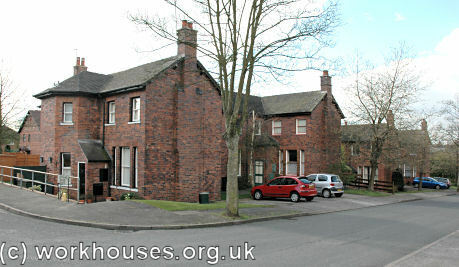 Penkhull Homes receiving block?, 2005. 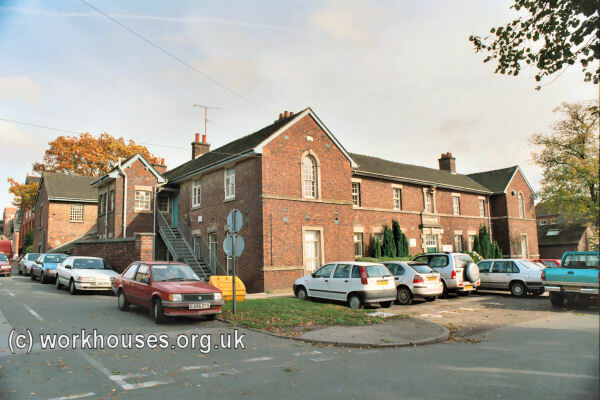 Penkhull Homes children's houses, 2005. Penkhull Homes school building?, 2005. 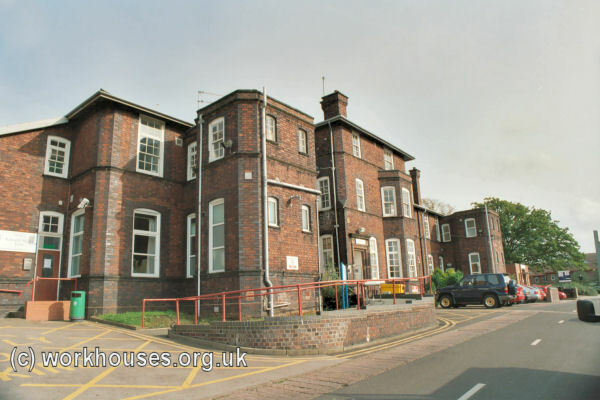 Penkhull Homes infirmary building?, 2005. 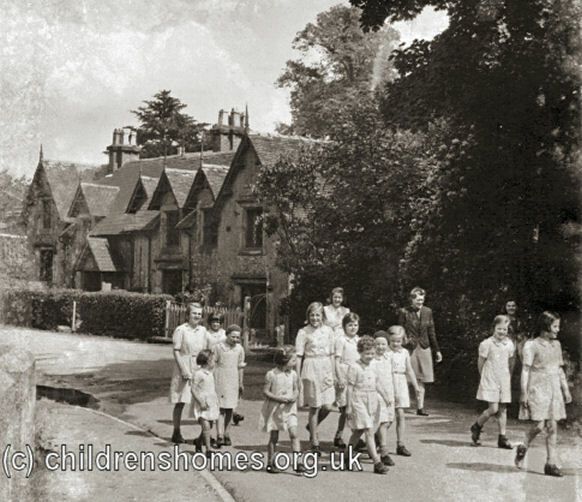 In 1924, the number of homes was increased to twenty-two taking the site's total capacity up to three hundred children. Penkhull Homes additional children's houses, 2005. Penkhull children on a ramble to Trentham, date unknown. The homes continued in operation up until the 1980s. A former resident was the British actor Neil Morrisey. The homes have now been adapted for residential use. 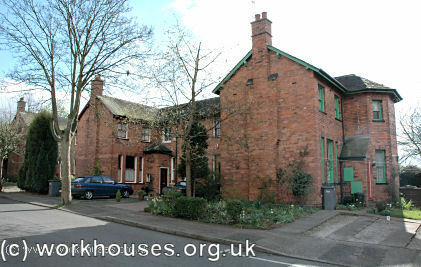 One of the former communal buildings is now used as a residential care home. In addition to the Penkhull cottage homes, the Stoke and Wolstanton Union operated a number of scattered homes. In 1924, the locations of the homes were: Basford Hall, Basford; Oxford Road, Basford; and 2 Stanley Street. The latter had previously been inherited from the Wolstanton and Burslem Union at its merger with the Stoke-upon-Trent Union in 1922. By 1929, the scattered homes appear to have ceased operating. Stoke on Trent City Archives, Hanley Library, Bethesda Street, Hanley, Stoke on Trent ST1 3RS. Holdings include: Guardians' minute books (1876-1922); Year books (1915-21); Register of Children Maintained at the Home at Penkhull; etc. 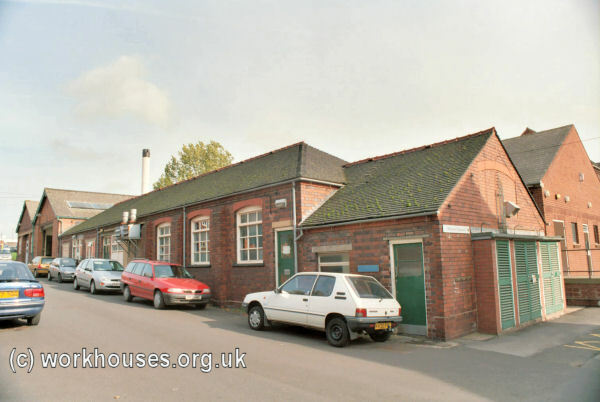 Workhouses in the Potteries by Diane Baker (1984, City of Stoke on Trent Historic Buildings Survey).